I’m sick and tired of cramped websites that have tiny type and don’t use the whole screen well. I’ve come to believe that the problem with reading on a screen isn’t the backlight—it’s that the type is too freaking small. Most designers don’t even know that there is an optimal number of characters per line. Let me take you through some of my thinking so that you can consider if you can take away any ideas to use on a project of your own. The fact you’ve read to this paragraph is proof that there is something to my argument. 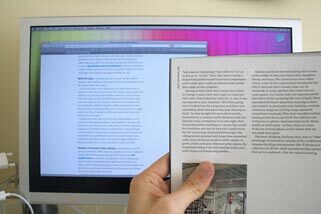 Screen reading should mimic printed reading. Why does web type resemble dictionary reading? Information Architects on designing for easy reading. I often hear people complain that they don’t like reading on a screen because of the backlight—I believe the real reason is tiny type. Reading online is more analogous to reading a dictionary than reading a book. The text is small and thin columned, it’s obvious that the designers goal was to fit a lot of information into a small amount of space. This may work for some applications, but lengthy reading is definitely not one of them. On each full paragraph line of text on this blog there are about 75 characters—which is widely regarded as the most characters that you can put on a line and still have it optimal for readers. Too long – if a line of text is too long the visitor’s eye will have a hard time focusing on the text. This is because the length makes it difficult to get an idea of where the line starts and ends. Furthermore it can be difficult to continue from the correct line in large blocks of text. Too short – if a line is too short the eye will have to travel back too often, breaking the reader’s rhythm. Too short lines also tend to stress people, making them begin on the next line before finishing the current one (hence skipping potentially important words). #4 — I want readers to engage—so I lost the noise. I designed this site to give an “information scent” with a large title, quick summary, and hook. Then I focus on removing distraction and delivering the best writing I can. To ensure that your type can be readable it’s important to let the lines of type breathe. There is actually a ratio between type size, characters per line, column width, and line height. You can use this great calculator to help dial it in. I hope that this article has at least caused you to think about the way your web page displays text.I would love to hear your thoughts on this. Time will only tell if this set up will be fruitful.